Eugen Heilmann went the distance to lead the UNTOUCHABLES to a 5-1 win in game three and a 2-1 advantage in the best-of-five series. MANNHEIM started strong and Billy Hess scored in the first inning on a single by Jens Heymer. Sascha Brockmeyer (3-4) tied the game in the third and scored the go-ahead run in the fourth through a bases loaded walk by Mitch Franke. RBI doubles by Brockmeyer and Oliver Neisemeier made it 4-1 in the sixth. Neisemeier later scored on an error. Martin Dewald started for the TORNADOS and took the loss. The guests faced elimination in game four, but could rely on ace Eddie Aucoin to even the series. In addition the TORNADOS offense had a perfect start , scoring three runs in the first and two in the third en route to a 6-2 victory. Marvin Appiah had a big two-run double. Billy Hess and Chris Falls each scored twice. PADERBORN tried to come back in the fourth, cutting the deficit to 2-5 on a RBI double by Jendrick Speer and a RBI single by Cy Donald. But it was not enough against a strong Aucoin, who allowed just seven hits in the win. Beningo Ozuna settled down after the rough start, but took the loss anyway. With the series tied, both teams met again on Sunday for the decisive thriller. MANNHEIM overcame deficits of 4-7 and 5-8 and won it 9-8 through two runs in the top of the ninth. Rene Franke tied it on an error. Billy Hess drove in the winning run on a single. 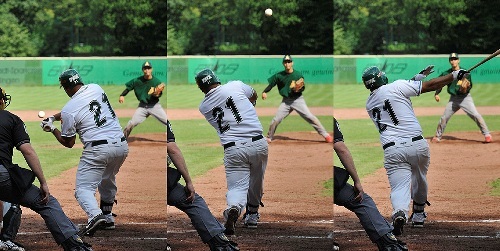 PADERBORN put two runners on in the bottom of the frame, but a double play ended the threat and the series. The TORNADOS had the better start into the match, scoring three runs on in the first against home starter Daniel Hinz. But the UNTOUCHABLES came right back, putting five runs on the board in the bottom of the period. They built up the advantage, but MANNHEIM came back eventually against reliever Heilmann, who pitched another six innings, after going nine on Saturday. The TORNADOS started with Franke on the mound. Paul Waterman picked up the win. Daniel Rahn took the loss. After two thrilling games in Mainz, the series between the German champions of 2006 and 2007 switched to Solingen. The ALLIGATORS used a six-run fifth to crush the ATHLETICS 8-1 in game three to take the lead in the best-of-five series. Patrick Kanthak and Florian Goetze had RBI doubles. Dustin Hughes drove in two. Enorbel Marquez-Ramirez had another complete game for the win, striking out eleven. Manuel Moeller pitched 4 1/3 innings to take the loss. The fourth and decisive match was similar to the third. The ALLIGATORS nearly scored at will and their pitching held the MAINZ offense without many scoring opportunities. Andre Hughes struck out eleven to lead SOLINGEN to a 7-0 shutout and into the semi-finals. Christian Nsien provided him with the necessary run support in the first, hitting a two-run homerun for the 2-0 early lead. Nsien finished with three RBI and two runs scored. Dominik Wulf scored three times. Keigo Miyagi took the loss. The BUCHBINDER LEGIONAERE used their first of three match balls to complete the sweep against the CARDINALS and to move into the second round of the Bundesliga playoffs. They will host the ALLIGATORS for games one and two on the upcoming weekend. COLOGNE had the better start into the game, scoring twice in the first on Taishi Nakamura’s two-run triple. But REGENSBURG wasn’t shocked, answering with four runs in the bottom of the period. They built up the lead to 10-3 till the seventh on their way to an easy 11-5 win. Former CARDS catcher Markus Gienger had three hits, including two doubles, three RBI and two runs scored. Martin Almstetter allowed three runs in six innings for the win. Moritz Sckaer was charged with ten runs in also six innings to take the loss. The HEIDEKOEPFE scored six runs in the first three innings en route to a 10-1 victory and the sweep in the series against DORTMUND. Keith Maxwell, Robert Gruber and Johannes Schaeffler each drove in three. Simon Guehring scored thrice. Matt Kemp scored the lone WANDERERS run in the fourth on a single by Rene Herlitzius. Herlitzius also started for the guests and took the loss after allowing twelve hits, seven runs and two walks in seven innings. Markus Winkler picked up the win, pitching six solid innings. He gave up just two hits, a run and a walk, while striking out four. Hagen Raetz closed out the game with three one-hit innings of relief for the save. HEIDENHEIM travels to Mannheim this weekend to open the best-of-five semi-final series against the TORNADOS.